This is the stern section of a Valley Boat built in England. The owner was playing in Deception Pass (between Whidbey and Fidalgo Islands Washington State) on the flood when he got caught in a whirlpool, went inverted and snagged the stern in a crevice in a rock wall. The stress on the boat caused what witness described as an explosion. One witness said he looked up at the bridge thinking there had been a car accident. Once ashore the stern was taped up and the boat was paddled the next day in Deception Pass. 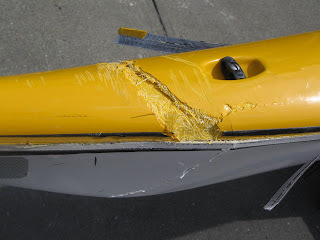 Within hours word of the accident had reached East Sound on Orcas Island and paddlers started making their way down to Deception Pass to see what was up. Today the boat has been repaired and is ready for another full on adventure.